I have been going through a ton of sugar these past few weeks. I've decided now is a good time of year to get back into candy making since it is the biggest candy eating season of the year! I need to head to the grocery store and stock up on sugar when it goes on sale. 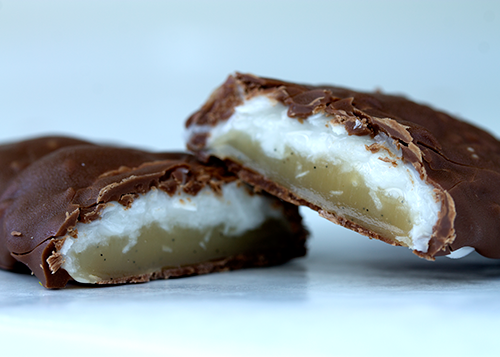 Today we have a combination of two of my favorite candies - caramel and coconut! These were not a good candy for my braces. Shh, don't tell my orthodontist! 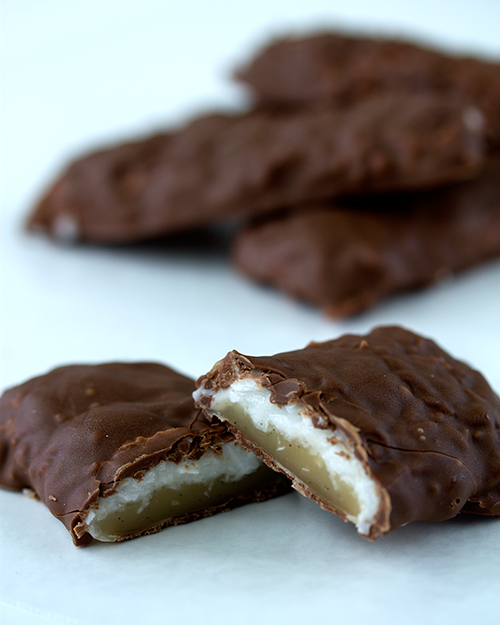 The coconut is crunchy and fluffy, while the caramel is smooth and sweet. Just look at those little vanilla seeds dotting the caramel! So adorable. PS - these were delicious and totally worth the extra brushing. Coat an 8x8-inch pan with cooking spray and line with plastic wrap. In a small 2-quart saucepan, combine water, sugar and corn syrup and clip on a candy thermometer. Bring to a boil over medium heat and cook until the temperature reaches 246 ºF. Remove from the heat and add coconut, stir until completely coated. Add marshmallow creme and stir with a rubber spatula. Pour candy mixture into the prepared pan and smooth out with an offset spatula. Set a bowl of icey water next to the stove along with some spoons. In a 2-quart pot, combine water, sugar, vanilla bean, sweetened condensed milk, corn syrup and butter. Stir while cooking over medium heat. Clip on a candy thermometer and cook until temperature reaches 240 ºF. Dip a spoon in the caramel mixture and plunge into the icey water for 5 seconds. Test the caramel for hardness. If it's still very liquidy, continue to cook until temperature reaches 245 ºF. Pour caramel over the coconut layer. Let set for at least 2 hours. Temper chocolate in a double boiler. Once slab of candy is set, remove from the pan by pulling up on the plastic wrap. Set on the counter, caramel side up. Pour some of the tempered chocolate on top of the caramel and smooth out with an offset spatula. Allow chocolate to set. Flip candy slab over and peel off plastic wrap. Trim the edges so the slab is square. Cut slab into 12 bars. Place candy bars on a wire rack. Pour tempered chocolate over the bars. Garnish with extra shredded coconut if desired. Once coated, move to a piece of parchment paper to set. Questions? Comments? Concerns? Leave them here!